Freedom Stickers are a lifeline of hope to victims of human trafficking. 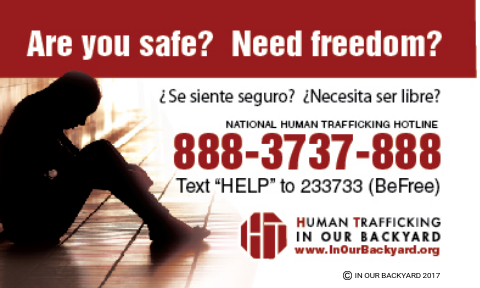 These life-saving Stickers are strategically placed in women’s and men’s restrooms because inside a public restroom is the safest place for a victim of human trafficking to ask for help, according to research. They were created in collaboration with survivors of human trafficking so that a victim of human trafficking would see one and call or text the hotline and have help on the way! 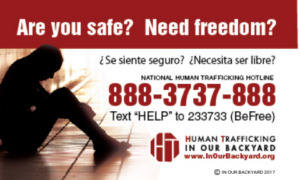 A 2016 study from Northeastern University found that one of the most effective ways to increase human trafficking arrests is by posting the National Human Trafficking Hotline in public places. Freedom Stickers are raising awareness, increasing arrests of traffickers, and providing a pathway to freedom for victims of human trafficking. They are stopping human trafficking. Nearly 200,000 have been distributed across all 50 states. Our vision is a Freedom Sticker in every public restroom stall – will you help? Request a Freedom Sticker Packet or donate today and become a Freedom Sticker Hero! 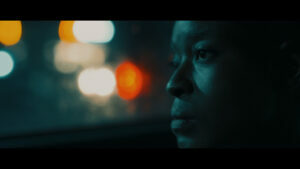 Watch our short film about Freedom Stickers below! Freedom Stickers were created by IN OUR BACKYARD in collaboration with survivors and first used in Central Oregon in 2011. IN OUR BACKYARD Founder and Executive Director, Nita Belles was approached by Oregon State Representative Whitsett’s office in 2015 and asked to advise them on a bill that would include the posting of The National Human Trafficking Hotline. Bill 3143 requires that Freedom Stickers go out with every renewed liquor license in the state of Oregon. In Our Backyard is a registered 501(c) organization. Copyright © 2019 IN OUR BACKYARD. All rights reserved. Web Hosting and Design by Web Hosting Hub.